My daughter is OBSESSED with Finding Nemo and Finding Dory right now. Seriously obsessed! She was sick a few weeks ago and couldn't move a muscle, so we snuggled and watched both movies on repeat. They were the first movies she sat through and she now talks about them constantly. 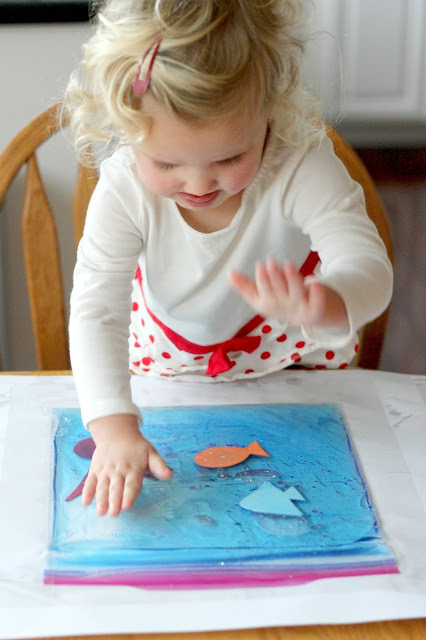 If I can't find the fish in her alphabet book fast enough she can't handle it! Every octopus she sees she calls, "Hank." It is hysterical and maddening at the same time. In an effort to cheer her up after I said no to watching Finding Dory today (she asks all day long, hoping my answer will change)... we made this simple ocean squish bag. We have a bunch of other favorite ocean activities I will be trying this week too. This one was a LIFE/SANITY SAVER. If your kid isn't obsessed with ocean animals, just throw whatever they ARE obsessed with into the bag and hopefully it can save your life like this little bag did for me today. Scroll down for more details. Start by cutting out your ocean animal shapes from foam sheets. I cut out a reddish octopus, orange fish, and glue fish. My ocean animals don't really look that great, but it really doesn't matter. 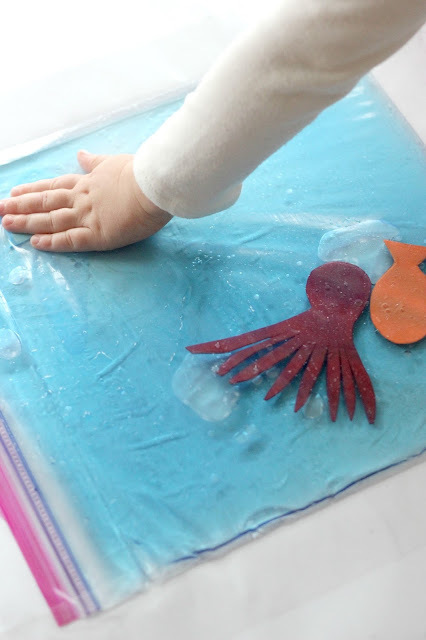 Next, add some water and blue food coloring to a large ziplock bag and then toss the foam animals into the bag. Slowly close the bag while trying to lay it flat and remove as many bubbles and as much air as possible. Leave a few bubbles though. Once the bag is closed, tape it shut and double bag it. 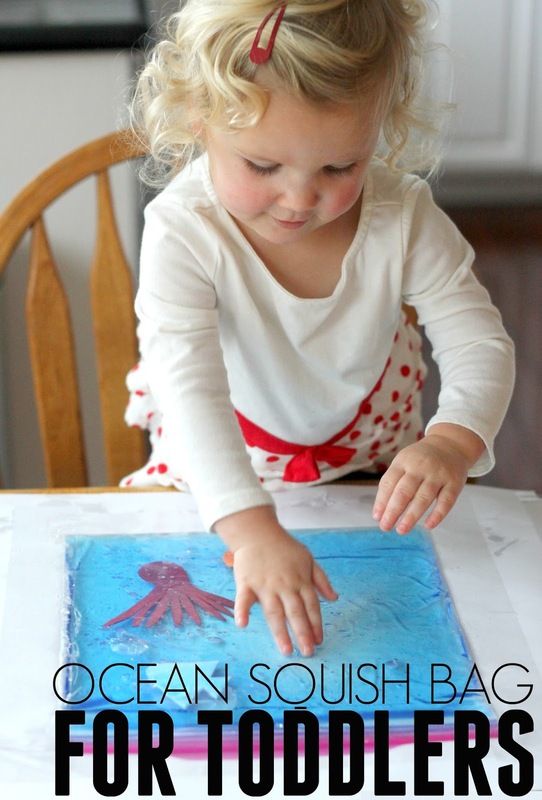 Then tape the bag to a table so that it is flat and kids can play with it. I taped a large white sheet of paper under our bag so that you could see the fishies a bit better (versus the designs of our wooden table). 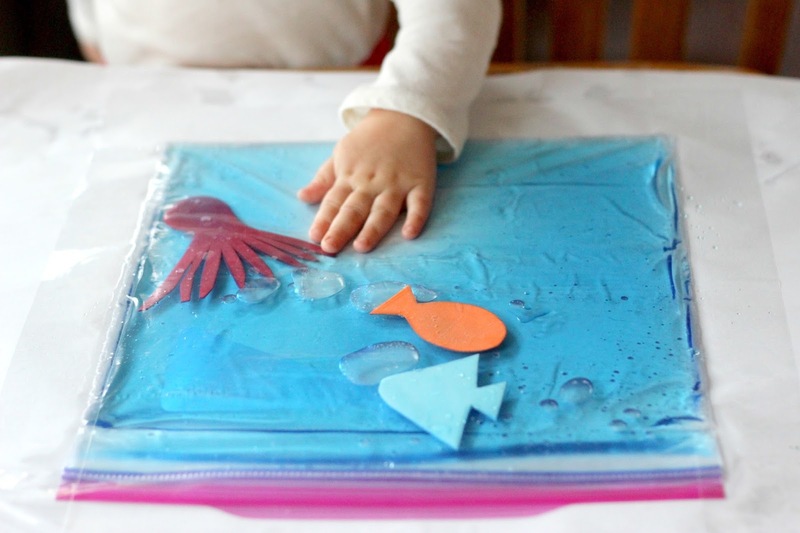 Once the bag is taped down securely, let your toddler explore and poke and touch the ziplock bag. This activity doesn't totally work with kids who are destructive and try and rip the bag off the table. 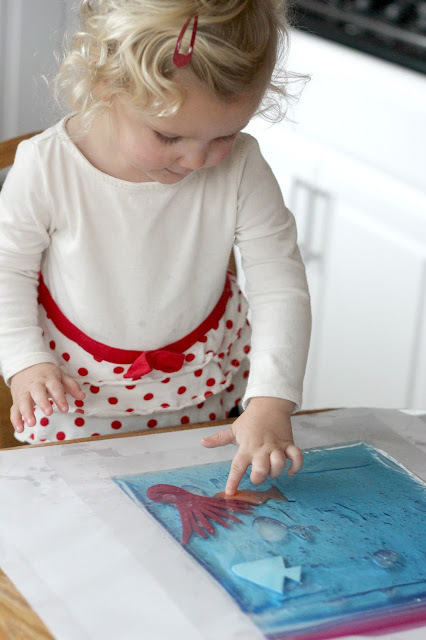 If your child is into that sort of playing, try a sensory bin with water instead. I like squish bags like this for when I am making dinner and I don't feel like making a messy/wet water sensory bin, but desperately need my little one to be distracted for a little bit. If the bag is double bagged, then it should be more challenging for the bags to rip. My toddler pushed the animals around and worked on popping the bubbles and talking to her ocean animals the whole time I made dinner. She also didn't ask me if she could watch Nemo or Dory again the rest of the evening... so I would call this a success! You can find more of our favorite ocean themed activities on our Ocean Week page. Does anyone else have a toddler that is obsessed with something currently?